A unique blend of cleaning agents designed for use on paintwork that has been treated with GEN-3GLASSCOAT ceramic protection. 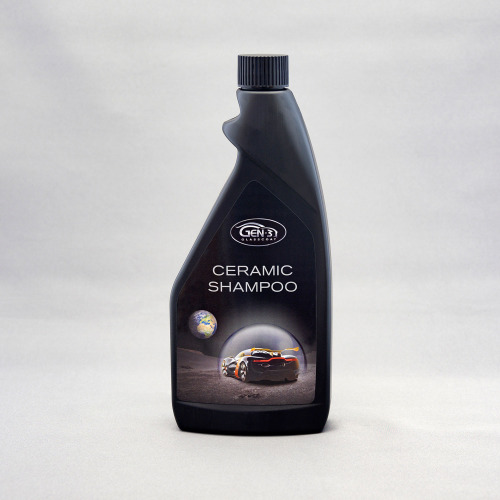 Simple to use, Ceramic Shampoo will produce excellent cleaning with superb water rinse off properties. Imparts a 'just waxedâ€™ look to newly cleaned surfaces â€“ without expensive wax based products. Suitable for hand and pressure washing. After rinsing, cars are almost dry and will need very little leathering to produce a spot free finish. Lasts for over two months and even prevents water borne dirt sticking to glass, plastic and paintwork.